In both of the stories in the third episode of ChangeMakers, we see women who had very little experience, entering male-dominated spaces and smashing it. By disrupting the business-as-usual approach, their innovations have had lasting impact. The first story is about mothers who are standing up to the gun lobby in the USA, and the second is about the women on the frontline of terrorism in Kenya. HOST: In 2008 in Australia, a newly-elected progressive government announced they were considering setting up a paid parental leave scheme. I had just fallen pregnant, so it was pretty front of mind for me. I was working in the union movement and was in charge of the state’s women’s committee. It didn’t take long for me to suggest “hey, we should call for 6 months paid maternity leave”. My boss thought it was a great idea but some in the union movement didn’t like it. The loudest opposition came from an older group of feminists who had been fighting for paid maternity leave for decades and thought I was a upstart who was hopelessly naive. They lobbied strongly to try and have our demand fall into line, and ask for a mere 14 weeks. I was – angry. We had a new government and a strong movement, why would we lead with such a minimal demand? Ever heard of the ambit claim? Rwanda had 14 week paid parental leave. Couldn’t a rich country like Australia do even a little better? So we battled it out. In my home state, a strong consensus grew around six months. A Commission of Inquiry was charged with making the final decision. In the end, it declared 18 weeks paid parental leave. I remember it because I was on maternity leave with my tiny little baby at that time. We were snuggling on a couch and I cried. Although, that might have just been the hormones. It wasn’t six months but it wasn’t 14 weeks. By breaking the rule that says defer to your elders we had won an extra month to spend with our babies. We had been ambitious, but also recognised that winning was key. And as mums we knew personally, exactly what it would mean to win – because it was our lives that would change. This is the powerful mix that can come when women lead a fight. It’s these lessons that lie at the centre of our stories today. Welcome to ChangeMakers, supported by our launch partner Mobilisation Lab. I’m Amanda Tattersall. Let’s go. CHRIS MURPHY: One final question: Do you think that guns have any place in or around schools? HOST: That’s Senator Chris Murphy from Connecticut in the United States. He’s questioning Betsy Devos, the billionaire businesswoman at her confirmation hearing to become Education Secretary. BETSY: Uh, I think that’s best left to locales and states to decide. CHRIS MURPHY: You can’t say definitively today that guns shouldn’t be in schools. HOST: Hear the exasperation in the Senator’s voice? The woman who is about to be put in charge of all the schools in America refuses to say guns have no place there. This is the story of how pure exasperation has spawned a campaign against gun violence that breaks most of the rules of organising. And the reason it’s working is not just about who they’re fighting, but who is doing the fighting. On a cold day in 2013, an 18 year old teenager, dressed in black jeans and a black hoodie, entered Sandy Hook elementary school in Newtown Connecticut. Jennifer Hoppe was at her home in Washington DC hundreds of kilometres South. JENNIFER: You know it’s like one of those, those moments you never forget. it was a Friday, I was working from home because I was scheduled to go to my daughter’s school and give a presentation… to her kindergarten class. And I had the TV on in the background and I started hearing reports of a shooting at a school. DEEP SOT V/O: This is CNN Breaking News. It’s just coming across the wires here. Police responding to a shooting at Newtown elementary school in North Connecticut… There is a map there, Sandy Hook. JENNIFER: part of the sad reality of living in the United States is that didn’t really register with me when I heard shooting at a school. And as it as the news started to trickle in oh, there may be some casualties, there may be some children. And it just started to get worse and worse. And I was walking out the door and I was just about to shut off the TV, and I had my hand on the doorknob, and I heard it’s confirmed that 20 children were killed in that school. HOST: 20 children and 7 adults. JENNIFER: And it’s hard-, you know, when I say that it loud, it makes me tear up all over again. So then I went to my daughter’s kindergarten classroom and I was in front of 20, 21, you know, 5 year olds and it was…It was very shocking. HOST: Did you feel powerless? JENNIFER: I did, I felt like I didn’t know what to do and I felt like I had to something though. CHARLIE DANIELS (NRA): To the Aytollahs of Iran and terrorist you enable, listen up. You might have met our fresh-faced flower-child President and his weak-kneed Ivy league friends, but you haven’t met America, you haven’t met the heartland… No. You’ve never met America, and you ought prey you never do. I’m the National Rifle Association of America, and I’m freedom’s safest place. HOST: The NRA is a genuine kingmaker in the Republican Party. It wields its power in two ways. It throws around cash to support pro gun politicians, and oppose anyone who dares to believes in any form of gun control. It can afford to do this because it’s primarily funded by gun makers who oppose any and every restriction on gun ownership. JENNIFER: The leadership of the NRA, … is absolutely, completely out of the mainstream. Not just of the American population but of their own members. JENNIFER: I literally was having trouble sending my daughter to school in the morning. There was a policeman, a police car outside her school and I said, Oh my gosh, I have to do something. HOST: Jennifer wanted to do something. Anything. But what? JENNIFER: As that initial shock kind of started to wear off, I, I thought this cannot be the reality that I raise my children in. … And if I don’t do something now, the next time it happens. I’m complicit in that tragedy. HOST: Shannon Watts, a mother of five who lived near Sandy Hook elementary, found herself in the same situation. And so she went online trying to find a group that she could join to channel her energy. In the 1980s and 90s there had been a group called Mothers Against Drunk Driving which had successfully lobbied for tighter laws on drink driving. JENNIFER: She was looking for the equivalent of that for gun violence prevention. And she didn’t find anything so she started a Facebook page. HOST: Originally, she called it “One Million Moms for Gun Control”. It was an ambitious goal — to hold a rally of one million moms. Think about that. Her initial instinct was to call for Mom’s to take action. This wasn’t about raising awareness, or signing up to voice passive support. It was a call to do something, anything. It resonated with how Jennifer was feeling. JENNIFER: This feeling was replicated all across the country with primarily moms and women, and just really wanting to do something. HOST: Within weeks, the Facebook page had thousands of likes. The thing that united everyone was the desire to take action. HOST: One of the people who joined Moms Demand Action in the early days was Lucy McBath. Just months before, she had a series of conversations with her teenage son about gun violence. LUCY: I specifically remember the day we had the first discussion about it, we were in my bedroom and I just kinda remember listening to him asking these questions. And I was trying to figure out how do I explain to my child that, as a young black male, there are many people in this country that won’t hold any value towards him and his life and his being. HOST: They talked about the case of Trayvon Martin, an African-American kid who was shot and killed. His killer, George Zimmerman, was acquitted of all charges. LUCY: And I remember Jordan saying – Mom, that’s not going to happen to me. You know that’s 16-year old bravado. I can take care of myself. That’s not going to happen to me, what happened to Trayvon won’t, won’t happen to me. HOST: In late November – just weeks before Sandy Hook, Lucy was visiting her relatives in Chicago for Thanksgiving. Her son Jordon was at his dad’s house in Florida. …where are you? And I said I’m, I’m here, at Terry and Earl’s house in Chicago. And he’s like, but where are you? And I said I’m in the bedroom, why? He said go get Earl and Earl is my cousin. …And I said —Earl is downstairs. Why do I need to go get Earl? Where’s Jordan? HOST: Lucy’s son was shot in a dispute over the volume of the music he was playing in his car. LUCY: And then when I found out that he was shot…you know…for playing loud music in the car. …I just couldn’t comprehend how that could be. But I understood immediately, as Jordan’s father did, that it wasn’t really about the music. It was really about the implicit bias, and the racism. HOST: So when Mom’s Demand Action held a rally in her city, it was like a calling. LUCY: I didn’t know anything at all about Moms, I didn’t know anything at all other than the fact that I was hurt… and I was not going to keep quiet about Jordan being gunned down the way that he was. HOST: The problem for Lucy and Jennifer and Shannon and all the moms who’d liked the page was — they weren’t seasoned activists. They didn’t have a game plan. Shannon had set up the Facebook page with the idea of organising a rally, but it was becoming clear it was this was much bigger than that. So she decided to hold some events, to allow people who were active on the Facebook page to meet face to face. JENNIFER: In late January, there was a March across Brooklyn Bridge in New York City that hundreds and hundreds of people attended. And then about a week to ten days later, there was another March in Washington DC that Shannon Watts participated in. I came out. A lot of other folks came out. It was the first time I met Shannon in person and just got involved from there. HOST: That’s when Jennifer got involved. Shannon had the idea that everyone would commit to doing 15 hours of work a week to build the movement. In reality, it quickly became much more than that. They also decided to change the name to “Moms Demand Action”. HOST: By the way, Jennifer worked in Marketing. JENNIFER: But very quickly we changed the name to Moms Demand Action For Gun Sense in America. And because that’s what… that’s what are doing, we’re not going away. HOST: So in a sense, the group decided that a One Million Moms rally was not ambitious enough. It wasn’t just about a rally. They were building a permanent, standing counterweight against the NRA. An organisation that moms could search for online and join so they could do something… anything. They were for gun control, but they were anything but extreme about it. HOST: What do you think of guns? JENNIFER: I support a responsible American right to have a gun if they are… law-abiding, if they are responsible. If they secure it in their home and keep it inaccessible to children. HOST: Have you ever owned a gun? JENNIFER: I have not owned a gun. My husband however is a gun owner. He…was a recreational shooter for a while and still does own guns. HOST: I’m going to just take a break from this story for a moment, because while we were doing post-production on this, the mass shooting in Las Vegas happened. 58 people killed by a man shooting from room high up in a casino hotel. In doing this show, one of the things that has struck me is that often it’s the game-changer demands, the ones that seem deeply unpragmatic, but which actually contain a genuine solution, that end up being the most effective. I get why Mom’s Demand Action and so many other moderate groups say they respect the second amendment. It makes them look moderate and sensible in the face of the extremism of the NRA. But as an outsider it doesn’t feel like much of a solution. And in politics, if you’re just tinkering at the edges, and don’t provide an actual new way of reconceiving a whole problem, then you’ll forever be playing in your opponent’s court, and constantly reacting to their agenda. Anyway, let’s get back to it. HOST: So Moms Demand Action wanted to be a permanent fixture, and they wanted to do something about guns in America. But what? DEBRA: They saw the Facebook page and signed on, and then there began this really amazing conversation about, well what should we do, what can we do? HOST: That’s Debra Rosen, a campaign professional, from Washington DC. DEBRA: Should we try to pass a law? Should we try to have a march on Washington? What does change, what does success look like for us? HOST: The problem that Shannon Watts faced was that she was not a campaign professional. She was an accidental activist. She had no idea what to do. So she took the system at face value when seasoned professionals might have been more skeptical. JENNIFER: Shannon and some other leaders you know, early leaders with the group, they organized a lobbying day on Capitol Hill where, you know, anyone could come and lobby their members of Congress. JENNIFER: We had no funding at that time, no…no financial support. And all of these moms took it upon themselves to come and talk to their members of Congress and say, You know, we’re the mothers of America and we’re not going to take this anymore. JENNIFER: It was easy enough for me to drive 20 minutes and come to that. But there were hundreds of mothers who flew into DC from across the country on their own dime. JENNIFER: A very common sense measure that is supported by over 90% of the population and even 74% of the members of the National Rifle Association. HOST: The idea was to close off a loophole that allowed people to get around the criminal background check required to buy a gun. HOST: So for a few days in March, instead of just holding another rally, hundreds of mothers booked in meetings and had face to face discussions with their representatives. The result was a bill, presented to the Senate. JENNIFER: It was a bi-partisan bill, very uncontroversial. HOST: The Manchin-Toomey Bill. Joe Manchin was a Democrat from West Virginia. Pat Toomey, a republican from Pennsylvania. The result? although it got more than 50% of the votes in the Senate, it didn’t reach the 60% needed to prevent pro-gun Senators from mounting a filibuster. The bill failed. JENNIFER: It was really extraordinarily disappointing defeat, but, at the same time, it was also extraordinarily motivating because people, moms, the moms of America got incredibly outraged. So if politicians weren’t listening to ordinary voters, who were they listening to? The NRA. Its lobbying clout made changing gun laws there virtually impossible. DEBRA: it very much felt like any change at the National Congressional level, any change in terms of national legislation was going to be really really tough. HOST: But the mothers were not so easily deterred. JENNIFER: So, …defaulting to oh, we have a broken system or there’s nothing we can do, that’s a recipe for not getting anything accomplished. And I think you can look over the, the course of American history and these things take time. HOST: No biggie. They realised they needed to take on the the entire Gun Lobby including the formidable NRA. 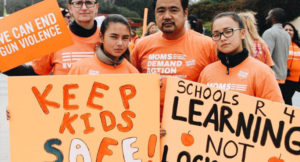 Whereas hundreds of other gun control groups had given up at this hurdle, Mom’s Demand Action simply saw their loss as a lesson that they had to become more powerful and change tactics. It was almost as if not knowing how the script usually plays out was an advantage. They didn’t know that the conventional thing to do at this point was to stop. JENNIFER: Through that defeat, we actually became even more galvanized. And have grown exponentially ever since. HOST: But how do you take on the Gun Lobby. In America? First, they got commitments. Mothers from around America all committed to spending 15 hours a week working on the campaign. And as Mum’s they had a very specific child focused way of articulating their frustration. JENNIFER: At that time I had a baby and we would take our babies to Congress …We called them stroller jams. … our objective is very simple and pure and that is to protect the lives of our children and all American children. It’s pretty powerful. HOST: Instead of just targeting Washington DC, and getting nowhere, they decided that ANY improvement, anywhere in America was better than nothing. They had Facebook followers in all 50 states. Why not use them? And why not go for a broader set of targets? DEBRA: They targeted several businesses that they thought would be amenable to having a policy on not allowing guns in their business. HOST: They may not been familiar with the halls of Congress but most Moms need a caffeine wake up. So, their first target? Starbucks. JENNIFER: So there had been this steady trawl of people openly carrying guns inside Starbucks. No one is allowed to smoke outside a Starbucks… So we really seized on the irony of that … a second hand bullet is at least as if not more deadly than second-hand smoke. JENNIFER: We didn’t do a boycott per se, but we had ‘skip Starbucks’ Saturdays. So on Saturdays we would ask all of our supporters to take a photo of themselves at home, saying …we’re skipping Starbucks this Saturday because we want them to change their policy. HOST: Which provoked a response from gun enthusiasts, who would go into their local Starbucks armed, and make their own selfies posing with their guns. Charming. There are many, many, many of these photos still floating around the internet. A clean-cut couple drinking frappicinos in the very recognisable corner of a Starbucks store. The woman has a large black pistol holstered on her skirt, while the man stands there holding the drink’s straw to his mouth with one hand, while he holds an AK-47 machine gun in his other hand. JENNIFER: And so we would amplify those photos as well, saying, look, this is what you’re welcoming into your stores, this is what you are encouraging, Starbucks, do you really want to do this? HOST: By now, Moms Demand Action had Facebook pages and groups for all 50 states, as well as an overarching national page. They used the groups to organise, the pages to broadcast to news feeds and then they had a national page to coordinate the message over the top of that. Every time they used the national page to amplify those photos, millions of people saw them. Even so, Starbucks stuck to their… guns. Sorry about that. JENNIFER: Their…their line had been, well, we follow state and local laws whether or not you can carry a gun, publicly, openly carry a gun into a Starbucks. And yet, simultaneously, where tobacco was concerned, they went above and beyond the law. HOST: Eventually however, they were forced to make a choice. JENNIFER: It was basically which side do you want to be on? And they wanted to be on the side of Moms. HOST: Starbucks became a domino target. Once it fell it became easier to shift a large group of retailers. HOST:Are these victories important because they are symbolic or do you think they actually have a real, broader impact? JENNIFER: Yeah, I mean, I think that they are…they’re both …What we’re trying to do is not just change the laws, of gun laws, but also the culture in the US. HOST: It was their only hope in the face of an ineffective political environment. Widen the fight, and take whatever victories you can. Because victories give confidence to your people and build your movement. It made sense to Lucy McBath. LUCY: Women like me, black mothers, were losing our children on the streets. And I felt like, …we’re the ones that are going to change the culture. We’re the ones that are going to spearhead the change, and we’re the ones that are going to get it done. Because what’s been done in the past apparently is not working. HOST: And their corporate victories had an impact, even while they were losing the political fight. For example, during this period, in Texas, a bill passed to allow people to openly carry hand-guns. So the moms got organised. JENNIFER: Our Moms in Texas started educating business owners and said, Hey, if you don’t want people to open carry in you stores, you don’t have to let that happen. HOST: By the time the bill passed into law, 500 businesses had decided to prohibit open carry, thanks to organised action by mums. JENNIFER: So that’s the kind of culture change that can come even in the face of, you know, legislative laws. HOST: And seeing their fight in the grand sweep of history, gave them the patience to persevere. LUCY: Anytime in this country we’ve changed a culture, it’s been years and years of grassroots organizing and movement that’s happened on the ground long before the policy change comes into play. The LGBTQ community, we’ve changed that culture. Mothers Against Drunk Drivers has changed the culture here. The tobacco industry culture has been changed. And all of those cultural shifts have been years of work on the ground, grassroots mobilizing. HOST: Mom’s Demand Action… and they’re delivering it — by doing it themselves. LUCY: And that’s how it happens. So you gotta be in it for the long haul. HOST: The reason Shannon’s Facebook page went viral at the beginning, was because people were wanting to feel like they were doing something. They wanted to change the law, but when that didn’t happen, instead of giving up, they came up with an innovative way to start achieving victories, so that sense of hope didn’t die. When their representatives failed them, they simply refused to take no for an answer. And instead of channelling their anger at the obvious target: the NRA and the gun lobby responsible for the terrible gun laws, they channelled their anger towards cultural change. Like a mum would tell you to do if a bully was teasing you, they sought out new friends like Starbucks, to channel their energies effectively. Instead of confronting their enemy head on, they simply went around them. HOST: Now another story born out of crisis, this time, in the heart of Africa. HOST: Picture a busy shopping mall like you might find in any city in the world. This one is in Nairobi, Kenya. It’s a normal Saturday morning in September, 2013. Security footage from that day shows shoppers milling around. A couple stand still. They look as though they’re trying to work out which store to go into next. A woman with an orange handbag strolls into frame and suddenly looks over her shoulder and starts running. At the same time three small kids grab onto their mother and then turn and run. They all run. And then they started shooting, indiscriminately. HOST: I’m in Kenya with an extraordinary tale of what happened in the months and years after the Westgate Mall Attack that left 67 people dead. It’s about the workers at the mall who survived that day. Remarkably, it’s an uplifting tale. HOST: Stephen Injusi was working as a security guard at Westgate on the day of the attack. He was at the main entrance. INTERVIEWER (HOST): And what equipment did you have? STEPHEN: I have my baton, this one…and a remote button. INTERVIEWER: When did you first find out that terrorists had arrived? STEPHEN: I hear something like a…gun shooting on the other side, or behind, behind the others. HOST: Stephen jumped over a wall to avoid being shot. STEPHEN: I walked slowly because I was injured some parts of my body. HOST: The siege lasted 48 hours. At the end, the terrorists had killed 67 people, and injured 175. Like most of the guards on duty, Stephen was armed with little more than a whistle. ISAAC: At the time of the attack of Westgate, we are sure if the private security officer had been properly trained and been properly equipped, that damage could have been reduced. HOST: That’s Isaac Andabwa. In 2007, he set up the Kenya National Private Security Workers Union. HOST: Problem was, Isaac’s union simply wasn’t big enough to demand better standards. A few hundred members at most. So at the beginning of 2013, months before the Westgate Mall attacks, Isaac reached out to UNI, a kind of global union based in Geneva. That’s where Nigel Flanagan came on the scene. HOST: Nigel helped Isaac get some funding to pay for four motorbikes to organise more members. In July of that year, after training the organisers, the union started a big organising drive. Nigel suggested a classic tactic: start by trying to unionise the company with the highest standards. They targeted an international logistics firm called G4S. ISAAC: It has betters rules. It has better training. It’s a global entity. So when G4S changes, then you can believe…trust in them. The other small companies in Kenya also follow them, the trend. HOST: Four motorbikes to organise one of the largest industries in a country of 46 million people. But you’ve gotta start somewhere, right? I hitched a ride on the back of a union motorbike. Let’s just say, on Kenya’s pot-holed roads, it was… perilous. HOST (INDICATIVE): I’m organising kenyan style! HOST: Right from the word go, one of the problems the four organisers faced was finding the right people inside the company to talk to. One day, Gladys was at work at G4S. She had the radio on, and she heard a union official talking about the new organising initiative. GLADYS: And when they were explaining what a union is, we took their numbers. Because they gave their numbers into the radio station. INTERVIEWER: Wow. So you first heard about the union on the radio? And they gave their phone numbers on the radio? INTERVIEWER: And you wrote it down and gave them a call? HOST: Isaac had no idea what had fallen into his lap. The four organisers that Isaac and Nigel had employed didn’t understand the issues at G4S as well as Gladys did. It wasn’t the organisers’ fault, it was because she worked there and they didn’t. It was the “in” the union desperately needed. INTERVIEWER: What was the actual issue at the workplace that got you angry initially? HOST: At any moment, Gladys’ boss could call her in, and sack her for no reason at all. This was one of the reasons workers like Gladys were coming out of the woodwork. HOST: The attack on Westgate Mall. One of the security guards that day was Maurice Ombisa. Maurice’s shift that day started at 6am. He got up at 5 and got dressed… Because he was a patroller, he hadn’t been given a full uniform, instead he wore a checked shirt. As he left, he said goodbye to his wife Eunice. Westgate Mall was 10 kilometres away from his home, so Maurice caught a matatu – a kind of public minibus – to get there. When the attackers went through the first gate, they refused to be searched by the guards who were there at gate. He came out to see what was going on. That is when he was killed. NIGEL: He was unarmed, badly trained, didn’t even have a proper uniform. HOST: Suddenly, security in Kenya took on a national significance and four motorbikes to organise the industry that was at the frontline of stopping terrorism started to feel pretty inadequate. NIGEL: And the guy who stood with him was expected to be back at work the next week. That one guy, really, his situation dramatically changed the atmosphere. HOST: People were angry. So the union decided to tear up the plan it had just started. ISAAC: So we said we need to fight and have the sector properly regulated. The private security officer must be properly armed, equipped, to do the job. HOST: Dorothy Chikane was one of the workers who’d gone with Gladys to meet the union once they’d found out it existed. Initially, she was surprised that a union for guards was even possible, given how unwieldy the industry was, lots of different companies all with different conditions. DOROTHY: But we did not know that security workers can have a union. HOST: In some ways, this naivety born of lack of experience was to serve the union well for the campaign. The fact that they didn’t know what a union was supposed to do, was a strength. NIGEL: I must emphasise this was their big idea, which instead of trying to organise in a particular company, they were trying to organise all security guards but they would organise them around the campaign to force the government to introduce some kind of statutory responsibility for the government to inspect and monitor security companies. HOST: Nigel was somewhat skeptical. HOST: Nevertheless, it was clear in the aftermath of Westgate, something had to change. NIGEL: In a change of strategy, we said, “Right. We’re going to have to tell the four organisers it’s not working. It wasn’t growing quickly enough. HOST: Instead, of using paid organisers, they enlisted volunteer shop-stewards, like Gladys and Dorothy to recruit guards to this much bigger, bolder idea. NIGEL: They had something like 140 activists and we used it to pay their travel so they could move around the country, signing people up, rather than four people trying to do it as a full-time job. Suddenly, we went from being four people working really hard and getting frustrated because it wasn’t working to funding all these activists and growing the network week-by-week so that they sign up thousands and thousands of workers. HOST: The volunteers channeled their anger at Westgate into action. I do think, without the Westgate tragedy, we might have persisted with our old failing strategy for quite a lot longer so it definitely had an impact. HOST: Under G4S’s company policy, they had to convince half the workers that a union was a good idea before they would be recognised by the company. The results, were, well let’s find out from Gladys. GLADYS: Within 3 week we had around 5,000 employees in the union. HOST: 5000 people in three weeks. Unbelievable. Somehow, Gladys manages to be modest about that. GLADYS: That was not hard because our company has very many employees. HOST: In fact, it was true – they needed 3000 more to get it past 50%. So they kept going. GLADYS: And within another 1 month, we had those people. HOST: So a union of a few hundred grew to 8000 new members in less than two months. GLADYS: So the union wrote a letter to the, to the company. And they agreed, they had no option. HOST: But the mystery here is – how did they do it? That’s the fastest the growth I’ve ever heard. They employed some clever tactics. They campaigned for workers to be trained, then used the new training centres as a site to recruit. Professionalising the workers became the key to also getting them unionised. And they used a mix of new and old technologies. They used mobile phones to stay in contact across their growing network. But they also trained shop stewards to maintain face to face contact with their growing membership. The Face to Face was especially important. Just ask Thomas Kiptoo, the union’s organising director. INTERVIEWER: How important is it was face-to-face for building trust with the security workers? THOMAS: It builds more trust because you talk to him today, and tomorrow when he finds another different message, he will just call you and you will just go there and talk to him. HOST: The union also took advantage of the fact they were much easier to spot when they were on duty in their uniforms. THOMAS: To get them is easier to get them when they are on duty. HOST: So by timing their efforts at a change of shifts, they could organise double the workers: those going into work, and then those knocking off for the day. Within a year, the union had grown from a few hundred to 16,000. HOST: One thing I noticed when we started doing this story, is that the organisers at the pointy end of this strategy all seemed to be women. Initially Nigel had thought it would be hard to recruit any women to the union. NIGEL: If we found one woman, our attitude is going to be, “Oh, my God.” We were wrong. We were totally wrong. HOST: Instead, the opposite was true. NIGEL: There’s very few security guard supervisors who are women and so forth. Boom. What we found was that the issues about training and wages and uniform and time away from work and the length of shifts all came under … They had it at what you might have called women’s issues. INTERVIEWER: Did that make you angry? DOROTHY: Yes. … to stop this we need to join the union also, as a lady. HOST: Just like pretty much everywhere else in the world, women who worked as security guards were also the primary caregivers, and frankly did most of the housework. DOROTHY: For me, I’m a security guard, I’m a mother, and I’m a union official. So this one, it’s very hard to manage, but I try my utmost. Because……Wake up around 4.20 am. From there, I start by making tea and make sure the breakfast is okay. …I’m at my place of work 5.30. So come 6 exactly, I have already put on my uniforms. I’m ready to work. HOST: Women had too much on their plate to put up with the cowboy conditions that were endemic in the industry. GLADYS: Ladies suffer …And that is why it was important, and it is important, simply because men doesn’t have many challenges at work. But for a lady, remember, we have maternity. NIGEL: Consequently, what we found was there was a disproportionate number of women becoming union activists. HOST: A year after WestGate, 2014, with 16,000 members, the union decided it was finally big enough to throw its weight around. Gladys, Dorothy, Isaac and their fellow organisers decided to march on parliament and demand the government pass a private member bill to regulate the entire security industry in Kenya. The held a rally in downtown Nairobi. GLADYS: When we gathered there, very many of us. HOST: They decided to march in their uniforms. INTERVIEWER: And how did you feel on that day, marching in full uniform to Parliament House? GLADYS: It was a bit nervous simply because you could be terminated from your work. DOROTHY: We were almost 500 people, even more than that. So we were so many. HOST: The march brought downtown Nairobi to a halt. NIGEL: That was clear, physical evidence of mobilisation. The workers who were involved in the campaign, it was their campaign. This was not a professional lobbying operation. This is workers coming out and saying, “We want change.” That was a real high. The whole day was just incredibly to me. HOST: The result? Eventually, after more organising, more lobbying, and plenty of parliamentary procedure, the bill passed into law in May 2016. DOROTHY: Your boss cannot just wake up one morning and tell you: Chikane, dismissed! He will think twice: what union will tell me? HOST: The union’s membership kept growing so that today it’s almost 50,000 strong. The bill enshrines minimum standards of training and salaries across the industry, and regulation of everything from firearm use to dismissal procedures. The consequence has had a profound impact on worker’s lives, both at work and home. DOROTHY: You feel you are somewhere safe. You are safe always whenever you go. You are safe. Your job is at…your job is safe, yourself you are safe. HOST: While the companies they worked for provided security to the public, now the union had the power to provide them with a sense of security for themselves. But most importantly, security guards are no longer taken for granted. The lesson of Westgate is not that terrible things happen for a reason, but that a terrible thing happened and the union gave it a reason. And that’s the same with Sandy Hook. Out of tragedy came something new and enduring. In both stories, crisis created an environment where radical change felt necessary. People had nothing to lose when they were responding to the threat to their husbands dying on the frontline or children dying because of how loud the music was in their car. And out of each crisis came radically innovative tactics, and fueled a creative approach to the strategy. But then it was more – in Kenya, the new, more open strategy of supporting union stewards to do the organising opened up the union to a set of voices that hadn’t been heard before – the women security guards. And in the US, the failure of representative politics forced the Mums to forge new allies. People like Gladys and Dorothy weren’t wall flowers. They were already masters of balancing work and looking after their kids. They had different ways of organising. And didn’t see the obstacles to organising that more experienced people saw, and as a result – grew their union far faster than anyone thought possible. In many organisations, women don’t get to play a leadership role, but in these ones they did. And what a difference! LUCY: And who better to do that than a mother who’s protecting…the preservation of her own generations?